SiteShadow pulls information from other web sites, and places it within your own content as if it were your own. Put a favourite web site on your own web site, changing graphics, header, footer, or names. Download SiteShadow by CrookedBush.com Inc.
PCWin Note: SiteShadow 50821-2052 download version indexed from servers all over the world. There are inherent dangers in the use of any software available for download on the Internet. PCWin free download center makes no representations as to the content of SiteShadow version/build 50821-2052 is accurate, complete, virus free or do not infringe the rights of any third party. PCWin has not developed this software SiteShadow and in no way responsible for the use of the software and any damage done to your systems. You are solely responsible for adequate protection and backup of the data and equipment used in connection with using software SiteShadow. Browser Sentry Content Filter - Browser Sentry is a content filtering software application designed to prevent the viewing of sites which are unsuitable for children and incompatible with daily workplace internet use. Perfect for parents and employers. SiteShadow 50821-2052 - This is a neat way to mimic content from another site. HM WebCopy - Use HM WebCopy to copy and save only the interesting part of a Web page as HTML file on your computer without annoying banners, ads and navigation elements. Later you can read the saved HTML file offline in piece. PipeBoost - PipeBoost™ is an HTTP compression software that runs on Internet Information Services 4.0, 5.x, 6.0. It compresses static/dynamic content that is downloaded by a browser running on a customer or end user’s computer. AmazeCopy - AmazeCopy enables you to save web pages for offline use. Permanently Save all the Valuable information you see on the Web. Webpage Capture - Webpage capture takes a snapshot of a complete webpage as image instead of HTML. This is useful for keeping track of pages visited and for storing information for later use. 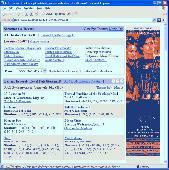 Webpage capture makes an image of the Browser's content page. SiteMap XML Dynamic SiteMap Generator - SiteMap XML Dynamic SiteMap Generator, is a php based generator for Google, XML, RSS, HTML and Text site maps. It includes a range of configurable variables and can be run as an online form for Static SiteMaps or to create real time Dynamic SiteMaps. SiteSpinner - SiteSpinner makes it easy for anyone to design and publish useful, professional looking websites. SiteSpinner is an affordable, easy to use yet powerful drag-and-drop website creation tool that includes everything you need in one package. More Software of "CrookedBush.com Inc."
AutoFollowup - This is truly amazing! If you've ever wasted hours of time sending out emails, only to have them bounce-- or go nowhere. . . if you've ever wished it was easier to manage unsubscribe requests, subscribe requests, keeping track of sales letters, managing multiple products-- if you're convinced that email marketing works, you just don't like doing it, then this is for you. Servicebuilder - ServiceBuilder is a church software database program for scheduling worship services and seeker services. Create groups and sub groups, organise your instrumentalists, your dramas, your specials, everything! AFU Form Submit - This script gives you form processing power! Request any information from your user and have it emailed to you automatically in text and HTML format. AFU Plugins - These scripts combine with Auto FollowUp. AFU allows people to subscribe to the autoresponder by email, but this collection contains a script that will actually answer an email! It will respond to email subscribe and unsubscribe requests. Bible in One Year - Another script for your church site: this allows your congregation to read through the Bible in a year, either by visiting your site each day, or subscribing to the RSS feed. Blog - Poster - An easy blog posting script which works with Blosxom and allows you to post from any web browser, or by sending an email to your pop account. Make posts with a PDA simply by mailing to your blog and syncing up.